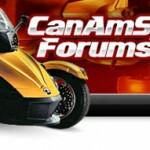 For 2013 the Spyder ST joins Can-Am’s Roadster lineup. 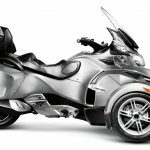 Available in three trim levels, ST, ST-S (pictured above) and ST Limited, the new Spyder creates a whole new category for Can-Am (Sport-Touring) while increasing the entire 2013 model lineup to 18 models. The new ST represents a middle ground between the sporty RS and touring RT models: more relaxed ergonomics and better wind protection than the RS, without the integrated rear luggage and bells and whistles of the RT. The windscreen is manually adjustable with 4.0 inches of movement while the handlebars are 4.0 inches closer to the rider and 3.3 inches higher. The footpegs are moved forward 5.0 inches, reducing knee bend 15˚ (78˚ vs 93˚). The standard ST is powered by a 998 Rotax V-Twin engine with Ride-by-Wire control, and features a multifunction color display, adjustable passenger floorboards, a Digitally Encoded Security System (D.E.S.S.) and 44 liters of storage. 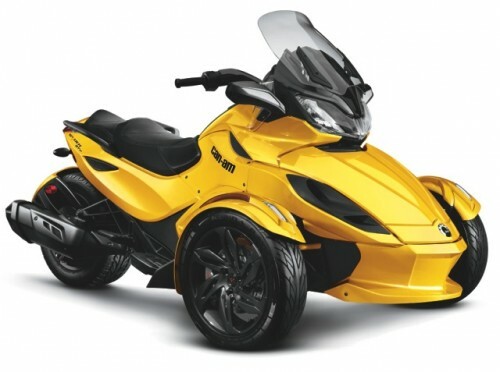 The S trim level adds Carbon Black six twin-blade-spoke front wheels with low-profile tires, redesigned front fenders with Integrated LED lights, rider floorboards (SE5 semi-automatic transmission only), cruise control, painted upper A-arms and front spoiler covers, and a carbon black treatment to the handlebar, footrests rear sprocket, exhaust and springs. 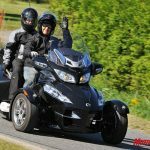 The Limited model adds an AM/FM audio system with iPod integration cable, weather band and optional satellite radio, a Garmin Zumo 660, removable rigid saddlebags, heated grips, embroidered seat, front cargo liner and a 12V power outlet. 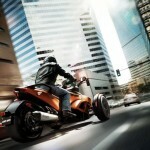 The Limited model also features 12-spoke chrome front wheels and chrome accents on the exhaust tip and heat shield. Colors for the new ST are Pure Magnesium Metallic for the standard model, Yellow Metallic and Pure Magnesium Metallic for the ST-S, while the Limited comes in Pearl White and Blackcurrant. Pricing for U.S. models is $18,899 for the base model with manual transmission, and $20,399 for the SE5 semi-automatic transmission, the ST-S with manual transmission is $20,099, while the SE5 goes for $21,799, and the Limited, which only comes with the SE5 transmission, retails for $24,599. 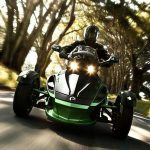 All 2013 model Spyders utilize a new chassis with increased rigidity, revised suspension, new front fenders, 15-inch wheels with low-profile tires, new Brembo calipers, and upgrades to the ABS system as well as the engine management system.